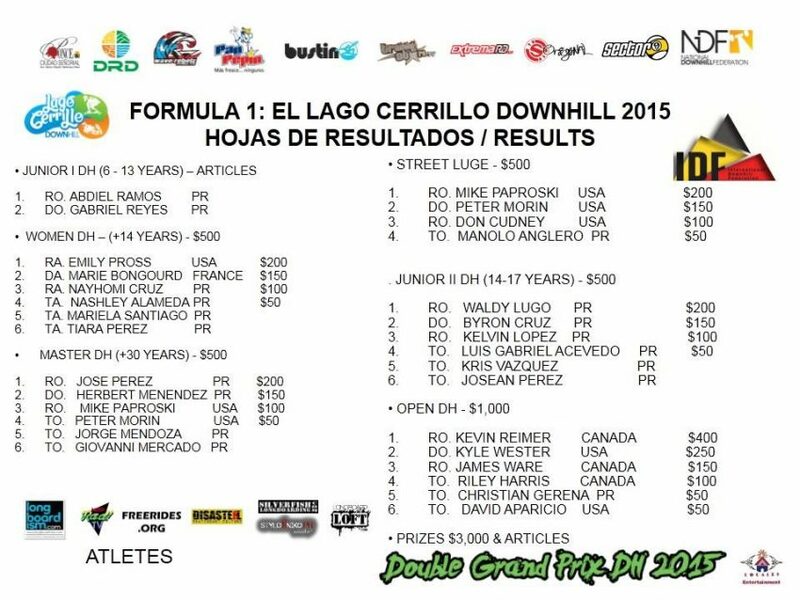 2015 marked the third consecutive year of Lago Cerrillo DH located in Poncé, Puerto Rico. This race hill is different than most tracks on the IDF tour as it involves no sliding with speeds up to 100 kmh (60 mph) and rough, highway width pavement. The usual Open class suspects attended: Kyle Wester, Kevin Reimer, Byron Essert, Riley Harris, along with a great collection of riders from Florida, North Carolina, the East Coast and of course the great representation of Puerto Riqueños. 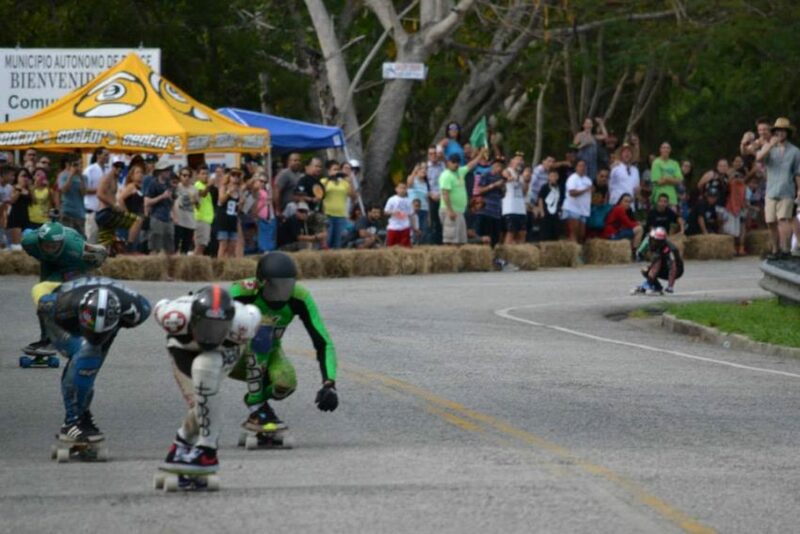 The women's class was also filled with International riders Marie "Spoky Woky" Bougourd, Emily Pross and Puerto Ricans who have the home turf advantage. The track builds speed quickly with a short push zone followed by a steep drop into a mild right hand 90°. As you finish the turn the track flattens out and riders are separated by the strength of their last push, their weight, and how much roll speed they can maintain along this slow stretch. Riders are usually bunched together by the end of the flat with the draft potential. As the flat ends, riders drop into the steepest part of the track that takes you up to the top speed of close to 100km/h before you enter a right hand 170° turn that is a challenge to hold steady through without sliding. After this turn there is a difficult sweeping, dropping left turn with pavement imperfections that jostle you from your tuck. The bottom section of the track is a back to back double apex right into a tight left followed by another fast straight again taking you up above 90km/h before the last left turn... An unpredictable left 100° turn that is blind as you enter, and finishes up with a short straight that reserves passing for those who improve on exit speed of the leading rider. Saturday was a slow start with riders waiting till almost noon for their first runs. It's a challenge to close this course and maintain its closure due to it being a thoroughfare. Riders are lucky to get to ride this hill as a race track at all! After two practice runs, the race went through two brackets of open qualifying, followed up by two round robin runs of Women's Class that were hotly contested. 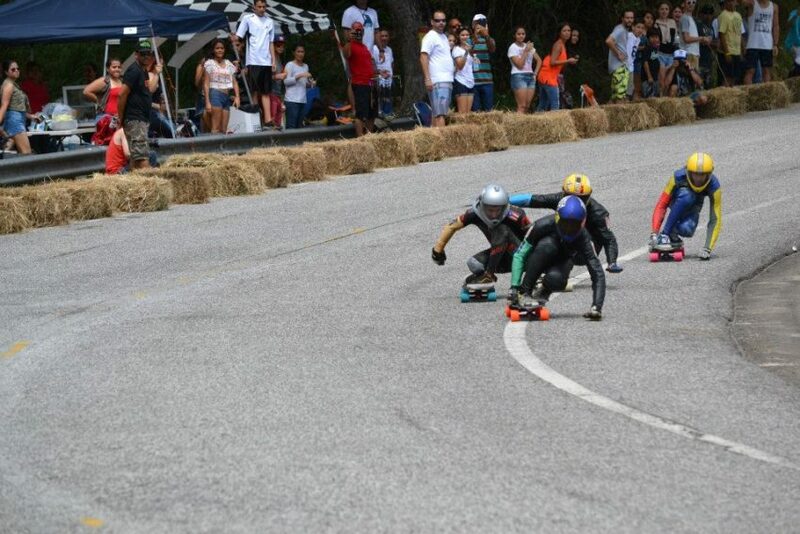 The Puerto Ricans have the home-turf advantage and also have some of the strongest pushes in the world which lead to the push start being a key set-up for the rest of the hill. A small upset in the 1st round occurred when local favorite Mariela Santiago fell on the push. 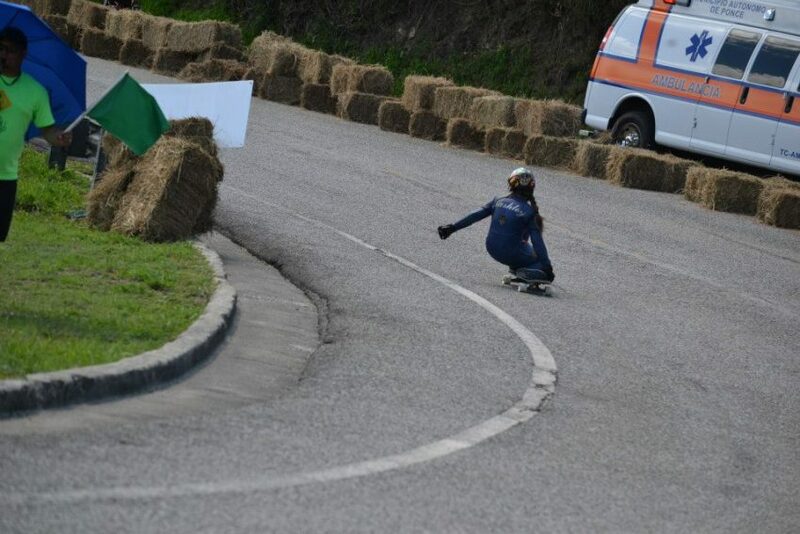 At the front of the heats, Marie and Emily would battle to the end each run, however Spoky was suffering from minor knee injuries from Guajataca that may have slowed her down. Emily asserted her dominance on the rough and fast track ending up in 1st place with Marie taking 2nd, and Nashley Alameda taking a well deserved 3rd place. Juniors and open racing took place on Sunday under even hotter conditions than Saturday. As the heat increased, riders were finding it challenging to keep hydrated, and keep their wheels sticking to the ground. The morning runs were quicker to start and the race picked up a good clip when the Juniors were on the hill which lead to Open getting on the track sooner than expected. With rains threatening the backside of the hill, the race organizer Machambo opted to run the Opens sooner than expected to finish before possible disaster. The track is heavy on guardrail and sweepers which is the worst situation when rain hits. Smooth racing with stacked brackets was the name of the game with an even mix of foreign and local riders being pitted against each other. 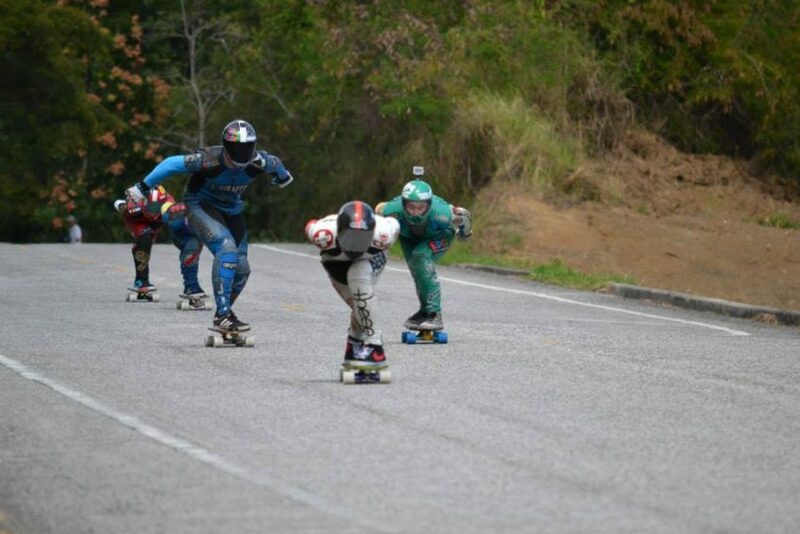 The local Puerto Ricans: Jomar "Black Mamba" Guzman, "Bettle Juice", Cliffor Deida, Jose "El Loko" Perez, "Chino", Kenneth Barreto, are the guys to beat on this hill. 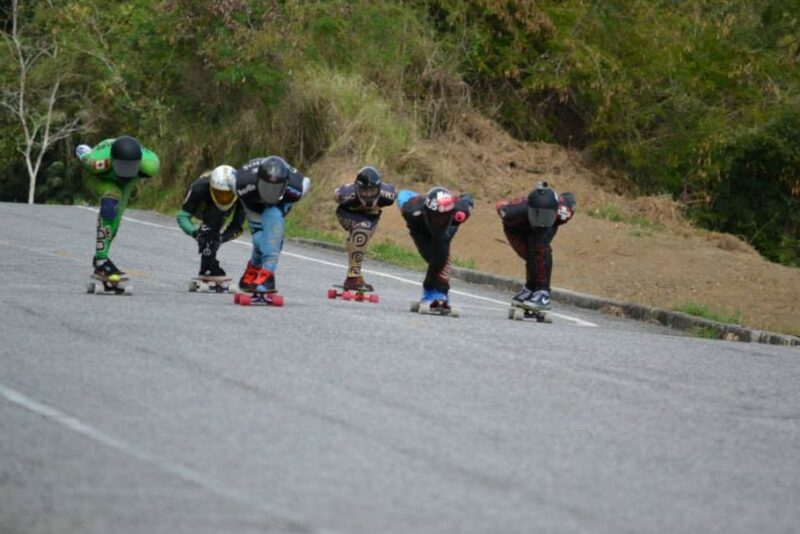 The Puerto Rican style is to beat you by miles off the push and then aggressively hold it out till the bottom of the hill. The 1st heat was a remarkable finish from Chino where he took 1st against 2013, and 2014 winner Kevin Reimer. The racing continued with a total of 4 rounds where each rider had to truly fight for their place in the next round. Racing at Poncé this year was super close as the rough pavement allowed for tighter racing with few riders having any noticeable advantage. The semi-finals were marked with a small upset where Byron Essert had contact with Dave "Apple Cheerios" in the final corner. The protected rule was put into place by David as he was in 1st and moved back to 5th after Byron went for a tight inside pass that resulted in some contact. Bettle, David, and James Ware moved onto the finals from that run. The other semis was a battle between Kevin Reimer, Kyle Wester, and Riley Harris battling it out into the finals. The finals was going to be a race off the start, and there was a minor slip up on the starting procedure that lead to a false start. Kevin Reimer held back while the rest of the heat took off early meaning he had to battle from 6th to 1st. The first flat was the section where moves were made and that was where Kevin took the lead. Kyle made a quick draft to take off into 1st place before the first right hand hairpin. Patience paid off as Kevin took an extra second to airbrake and take more exit speed out of the hairpin into the long straight. Riley Harris, being a lighter rider watched the plays go down and tried to make his move with multiple drafts but was unable to make time up. Both big riders battled it out to the bottom section nearly side by side into the last straight where Kevin had a clean line to set up for the last left. James "the Slimer" Ware made his move to double draft Kyle and Kevin and go for a last minute pass on Kyle before the line but the outside didn't pay off as he needed setting him in 3rd place over the line with Riley in 4th, Bettle in 5th and David in 6th. The event wrapped up atop the hand painted mural of street luger and downhill skater on the highway embankment. Riders were awarded small cash prizes, trophies while celebrating with ice cold refreshments. All Photos by Marcell Santos.